Dr Slot welcomes you to a world of adventure in Fire and Gold mobile slots! A world where the bravest mobile slots warriors must embark on an epic quest to seek legendary lost treasures. Do you dare to enter the dragon’s shadowy mountain lair on a mission to raid those riches? 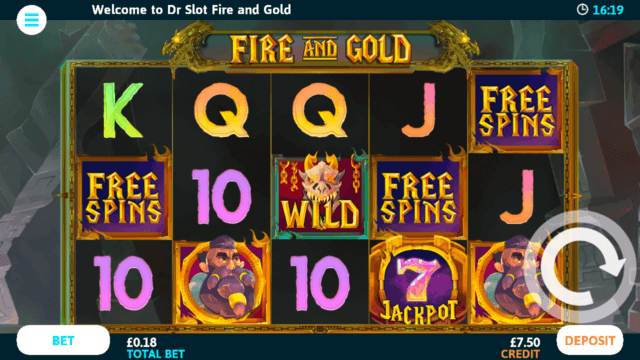 Fire and Gold is an exclusive mobile slots game that definitely has the wow factor, with 9 win lines, two dragon-dodging mini-games and a fabled progressive Jackpot that’s closely guarded by Dr Slot’s rather fiery friend. Can you fight the flames and escape with a fortune? Fire and Gold is compatible with iOS 10 and above, and Android 5 and above. Before you go rushing headlong into battle, you’ll want to sort your strategy first! It’s important that you set a ‘Total Bet’ amount that suits you. You can do this by pressing the ‘Bet’ button in the bottom left corner. Fire and Gold is locked to 9 win lines, so the only setting you need to adjust is your bet-per-line. You can bet anything from 2p a line up to a maximum of £20 per line. That bet-per-line will be automatically multiplied by 9, as you’ll always be playing across 9 win lines. Use the ‘+’ and ‘-’ buttons to increase or decrease your bet-per-line. As you do so, you’ll see your ‘Total Bet’ adjust automatically in the box above. When you’ve settled on a ‘Total Bet’ that you’re happy with, tap the floating white arrow to fire up the reels. If you need both hands free to wield your weapons, then Auto Spin can be a great ally. When in the ‘Bet’ menu, tap ‘Auto Spin’ and then enter your settings. You’ll need to choose a number of spins and a minimum credit level that you don’t want to fall below. Auto Spins will stop when all your spins are complete, or if you reach that minimum credit level. You can also set Auto Spin to stop if you have a single win exceeding your chosen amount. Press ‘Stop’ at any time to take back control. When you’ve mastered your ‘Total Bet’ settings, you’re ready to play Fire and Gold! You can play in landscape or portrait mode – just tilt your phone or tablet to see which one you prefer. When you’re ready, hit the white floating arrow and fire away! The reels will spin and come to a stop at random. If you’ve lined up enough matching symbols on an active win line, you’ll be victorious and claim a win! With some symbols, you’ll need to line up just 2 or more for a win, while with others, you’ll need a minimum of 3. There’s no need to wing it when it comes to understanding wins – you can check out the in-game Paytable by pressing the three horizontal lines in the top left corner and selecting ‘Paytable’. It’s easy to lose your way in the cavernous tunnels and dark mountain passages, but this should help you to get your bearings! Always remember that Fire and Gold’s win lines pay from left to right. It can be tough to carry all of your treasure around, so any wins will automatically go into your credit for safe keeping. Your winning lines will light up with dragon’s fire, and the amount you’ve won will appear on the reels, or in the bottom bar. Each combination of symbols you encounter in Fire and Gold is worth a certain multiplier, so when you win, you’ll receive a multiplier of your original bet-per-line. How big that multiplier is depends on which symbols you’ve lined up, and how many of them. Don’t forget – you can find full details of what each symbol combo is worth in the Paytable. There are a couple of golden rules to remember about win lines in Fire and Gold. First, you can only win once on each win line, so if you spin in more than one symbol combo on a single line, only the highest value win will count. However, if you conquer on more than one line with a single spin, all of your wins will be added together to give you a beast of a prize! Now usually, coming face-to-face with a fire-breathing dragon would mean your quest has come to a very sudden end, but in this game, it could mean you’ve struck gold. Wilds can stand in for any other symbol, except for mini-game and Free Spins, to grant you a win. So for example, if you lined up two 10s with a Wild alongside, the Wild will act as a third 10 and award you a win worth three 10s! The Wild dragon is still guarding that legendary treasure trove though, so he can’t help you to win the progressive Jackpot. You can only do that with 5 matching Jackpot symbols on an active win line! Fire and Gold has two dragon-dodging mini-games, both of which offer the chance to steal some mega multipliers from under her fire-breathing nose. To play Dragon’s Hoard, you’ll need to line up two or more of our valiant hero on an active win line – you know, the one with the fearsome facial hair. You’ll then see a wheel full of red and green segments, next to the sleeping dragon who should be keeping watch over the treasure! The more mini-game symbols you lined up to enter the game, the fewer ‘lose’ segments will be on the wheel, and the higher the prizes will be. To play, you simply need to spin the wheel! If you land on a green segment, the dragon will keep snoozing, so you’ll win the multiplier displayed on it and get to spin again. Land on a red segment and you’ve woken the dragon, so it’s time to collect your wins so far and scarper back to the main reels before you’re toast! To play the Wild Fire mini-game, you’ll need to line up two or more red dragon symbols on an active win line. The more symbols you line up, the larger the multipliers on offer will be. You’ll go deep inside the dragon’s lair, where you’ll need to spin the wheel to win! If you land on a multiplier, you’ll get to keep it and spin again. You’ll keep spinning and collecting treasure until you land on a ‘lose’ segment – then, you’ll collect all of your multipliers and return to the reels. If you land on ‘Heat Up’ at any point, all of the remaining multipliers on the wheel will increase in value before your next spin. Free Spins symbols are a magical ally in your quest for gold! If you line up 3, 4 or 5 Free Spins symbols on an active win line, you’ll unlock some serious sorcery and earn 5, 10, or 15 free spins respectively. Those free spins symbols will cast a spell over the reels, locking your bet-per-line to the same amount as your last paid-for spin. However, while those free spins are in play, not a penny will be taken from your credit balance, giving you a great opportunity hoard some extra gold! You’ll see how many free spins you have left displayed at the top of the reels. If you’re new to Dr Slot, you can take advantage of his generous welcome bonus offer! Sign up and make a first deposit of £10 or more to unlock up to £1,000 in deposit match bonuses and up to 120 FREE SPINS! * Create your account and begin your Fire and Gold mobile slots quest! Fire and Gold mobile slots has a theoretical return to player of 95.5%. This is based on long term playback.